The music rooms have lit up with the appearance of a new face: part time chorus teacher, David Arruda. Mr. Arruda came to Rockland from an extremely diverse musical background and was hired this summer by John Piazza, the music department head. Mr. Arruda’s last job was teaching at a K-8 school in Boston. When he found out he got the job in Rockland, he was very excited because he had not taught a high school choir in four years. The search for a part time chorus teacher began mid-spring of last year. Mr. Piazza said he was very specific about the qualities he was searching for. He wanted someone who had specific choral teaching experience, significant piano skills, professional performing experience outside of school, and professional commercial music experience. Also, Mr. Piazza says he wanted someone who knows the different styles of music and can perform it, is comfortable with the theatre, is familiar with recording technology, and is interested in developing electronic music curricula. “With Mr. Arruda, we hit the jackpot; we’re very lucky to have him at Rockland High School,” he said. Mr. Arruda says his interest in music started early in life. He first started learning how to play the piano when he was five, so that sparked his love for music. When he was in high school, he was inspired by a few teachers to become one himself; from there he decided to teach music because music was the subject he was best at. Mr. Arruda isn’t the only one excited that he is now working here. Ms. Lindsay Crook, a middle school music teacher, said that her typical work day has become so much easier now that Mr. Arruda has been hired. She likes working with him, and she said that she admires his ability to play any song on the piano off the top of his head. Ms. Crook said that all the students that she teaches also like Mr. Arruda. She also said that Mr. Arruda’s significant piano abilities allow him to draw in the attention of the younger kids. 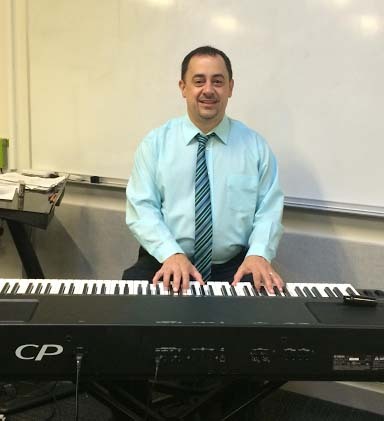 All in all, the students and staff of the music department are excited to have Mr. Arruda around and are looking forward to great things this year in the music department.